Washington DC is an amazing city filled with so much to do whether you want to learn how our laws are made and upheld, take in the memorials and monuments around the city, or find out more about the news cycle and how news is reported. It’s hard to fit everything in if you have just a few days to explore, but here are your best bets for spending three days in Washington, DC. Hop aboard an Old Town Trolley sightseeing tour. You can pick up a tour bus at many locations around the city and it’s a great way to get a lay of the land on your first day. The trolley tour is also an ideal way to see popular monuments, like the Jefferson Memorial and Lincoln Memorial, which are a bit of a hike, particularly when you just want to stop by for a photo or two. You may want to get off the tour bus to explore the Library of Congress and the Supreme Court. Both are near a row of restaurants along Pennsylvania Avenue, SE as well as Union Station, which has a variety of sit-down restaurants and a casual food court in the basement if you want to stop in for lunch or dinner. If you have time, the United States Botanic Garden is close by as well. Admission is free and it’s a great place to spend an hour or so. Kids will also enjoy both the Family Field Journal and the Junior Botanist program to help them learn more about the various plants at the museum. When you finish, grab some ice cream and take a walk around the Capitol Reflecting Pool. Head to the National Mall and stop in the National Air & Space Museum for a few hours right when they open at 10 am. This museum is extremely popular, so it’s best to get there before it gets too crowded. If you have time, take in an IMAX movie or a planetarium show. Next, pay a visit to your U.S. Senator or Representative. They more than likely will not be there when you arrive, but it’s fun to check out their offices. Plus, you’ll want to ask for free gallery passes so you can watch Congressional proceedings as they happen from the House or Senate Gallery. The passes are good for two years so hold onto them if Congress is out of session during your visit. Take a tour of the U.S. Capitol. You’ll want to check in with your Congressman’s office ahead of time to reserve a tour time so you can skip the line. The tour is just over an hour, including a 13-minute video and a guided tour of the Rotunda, Statuary Hall and the Crypt. Kids will especially love Statuary Hall, which features two statues of prominent citizens from each state. Have your kids find statues from your state to learn about these great Americans. The Newseum is a must and it’s just off the National Mall. Dedicated to journalism and newsmaking, this is one of my favorite museums. You’ll find some incredible exhibits here, like the Pulitzer Prize Photographs Gallery and the 9/11 Gallery. They also have an interactive newsroom that lets visitors become news reporters, as well as fun traveling exhibits, like “Anchorman: The Exhibit,” which is on display through August 31. Just across the street from the Newseum is the National Museum of American History. I love the exhibit showcasing First Ladies. They also have fun exhibits focused on lunch boxes, Little Golden Books and puppets over the years, and even an ongoing exhibit dedicated to the Girl Scouts. You can check out a few more of my favorite Washington, DC museums, like the International Spy Museum and the National Postal Museum, all of which are just a few blocks from each other. Need Help Planning a Family Trip to Washington DC? 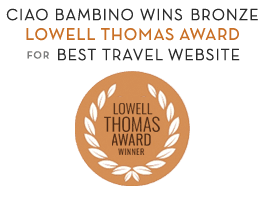 Ciao Bambino’s Family Vacation Consultant Team can help, from recommending family-friendly hotels to planning the full itinerary. Request assistance on My Trip Planner. Erin Gifford is a mother of four who writes about family travel at Kidventurous. In her free time, she likes to run half-marathons, enter 5K races with her girls and write about all things running at Run with Erin.